David Wessel red ink: Why the federal budget is still broken. 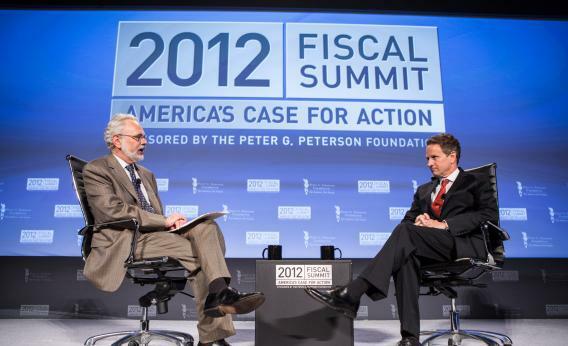 David Wessel (L), the author of “Red Ink: Inside the High-Stakes Politics of the Federal Budget,” speaks with Treasury Secretary Timothy Geithner. To understand the current state of the U.S. federal budget - and the policies the next president will be forced to pursue from day one - there are two pieces of required reading. The first is a two-year old wonky white paper entitled “The Moment of Truth,” by the National Commission on Fiscal Responsibility and Reform. The second is “Red Ink,” David Wessel’s handy new guide to understanding the politics of the federal budget. If the race between President Barack Obama and former Massachusetts Governor Mitt Romney is going to be about anything substantial, it should be a technocratic debate over how to fix the troubled balance sheet of the American republic. “The Moment of Truth,” otherwise known as the Bowles-Simpson plan for the names of its lead co-authors, and Wessel’s book offer two sides to the same coin. The first presents the danger to American power and prosperity from failure to address fiscal issues and proposes specific policy solutions. Wessel’s book explains why even the simplest and least painful of these will be so incredibly difficult to pursue. Wessel, a Wall Street Journal columnist, could not have better timing. Romney’s selection of Paul Ryan as his running mate has the potential to turn the presidential race into a discussion of two competing visions for balancing the American checkbook. Ryan, chair of House Budget Committee and a central character in Wessel’s compact (162 page) study, was a member of the Bowles-Simpson commission. The bipartisan group of 18 members including six senators and six representatives tried to address the country’s fiscal challenges, but Ryan refused to support the majority’s findings. President Obama also declined to put his full weight behind the suggested policies. The reason that the commission’s advice was not taken becomes apparent in Wessel’s accounting. While nobody loves the cost of government, everybody cherishes the things it specifically does for them - sending 11 aircraft carriers to ply the seas, putting a man on Mars or providing medical care to the poor and elderly. The last, along with the cost of Social Security and Medicaid, should be of greatest concern to future generations. At $555 billion, Medicare is already costs more than the Federal government spent in 1951 budget, adjusted for inflation. This reflects the wastefulness of the system rather than a doubling of the population. Last year this health insurance for the elderly consumed 21 percent of America’s total budget. If recent health care cost trends continue, the bill will rise by 75 percent over the next decade. Wessel sums up the politics succinctly. “These diverse financial arrangements have one thing in common: at the end of the pipeline is some American who is getting a check or a promise. Most are convinced they deserve the money.” For example, the farmers who receive the $15 billion in annually farm subsidies, much of it in the form of no-strings attached “direct payments,” and $10 billion in crop insurance relief resist cuts, even though about half of the money goes to families with annual incomes higher than $100,000. On the other side of the ledger from spending are taxes, specifically $1.1 trillion of deductions, exemptions or loopholes, or as Erskine Bowles, co-author of “Moment of Truth” with retired Republican Senator Alan Simpson, terms them “backdoor spending through the tax code.” Eliminating them could raise revenue nearly equal to half of the U.S. government’s top line. Getting rid of corporate loopholes alone would allow the overall tax rate paid by companies to fall to 28 percent from 35 percent. But as Wessel notes, such tax increases are no easier than reducing beloved spending programs: “Congress and presidents have discovered something simple: giving people a tax break makes them happy without increasing government ’spending’ and can accomplish the same objective,” even though there’s no economic difference to Uncle Sam’s income statement. Bowles-Simpson may offer a more clear-cut blueprint for righting America’s fiscal ship. But devoid of the political realities of a highly polarized Washington, it also oversimplifies the task the next president, and Congress, will face. Wessel’s book is the livelier, more readable companion to “The Moment of Truth.” Both shed valuable light on the inevitable political and legislative wrangling in the run-up to November’s election, and beyond.